Panther City Rugby offers a number of advantages to its participants. Some of these include the following. Panther City Rugby is one the best values in club sports. Our club fees are about half or less of other area select-side club sport organizations. We are confident that no club offers its participants more. Panther City Rugby provides participants with experienced and USA Rugby certified coaches. Most our coaches have played at the collegiate and adult (senior) levels. We emphasizes the development of positive character traits and leadership as well as strong competitors on the field. 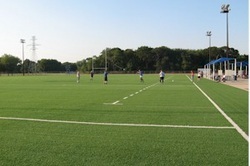 Panther City Rugby is fortunate to have regular access to artificial turf field at Trimble Technical HS in Fort Worth. This allows for activities in nearly all weather conditions. The facility is also supported with excellent field lighting evening practices and clean restrooms. When "Tech" is not available, Fort Worth Parks & Recreation have a number of quality fields including a rugby only grass field. In addition to its rugby pitch, the City has a number of premium soccer fields that it converts to rugby pitches for tournament play. These have included the Annual Cowtown Rugby Tournament hosted by Fort Worth Rugby Club, Panther City Rugby HS Invitational Tournament, as well as various tournaments for the USA Rugby Club Championship Series. Panther City Rugby is one of the few sport-clubs in Texas to ensure an athletic trainer is available at all practices and home competitions. This helps to ensure participants receive prompt, appropriate care when needed and improves their return to participation after injury. Panther City Rugby also offers rugby specific fitness training that improves the game-readiness and competitiveness of its participants. This added component, along with the abilities developed during practices, offers athletes a great opportunity for cross-training and pre/off-season conditioning.